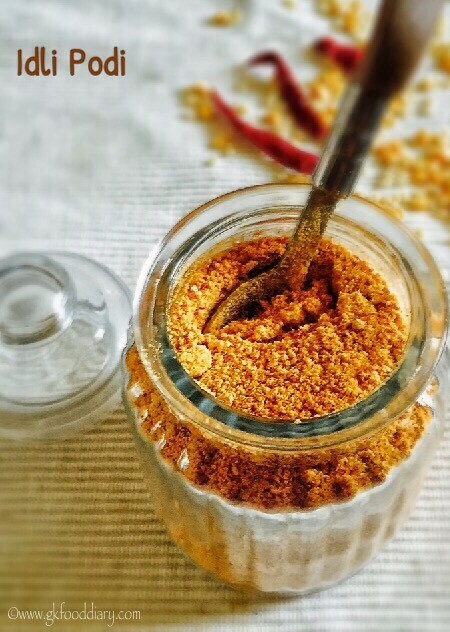 Idli powder or idli podi – mix of lentils, red chillies and spices, tastes best with idlies and dosa varieties. 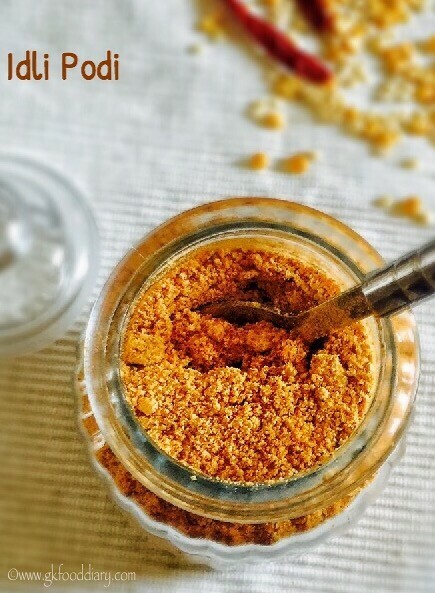 This idli powder is everyone’s favorite (especially kids) at our family as its so flavorful and tasty. Though we prepare variety of chutneys, sambar and side dish for idli & dosa, we all end up eating our last idli/dosa with this idli powder. It can be given to kids after two years once they started eating little spicy foods and joined eating with the family. Make sure to adjust the red chillies according to your child’s tolerance level. 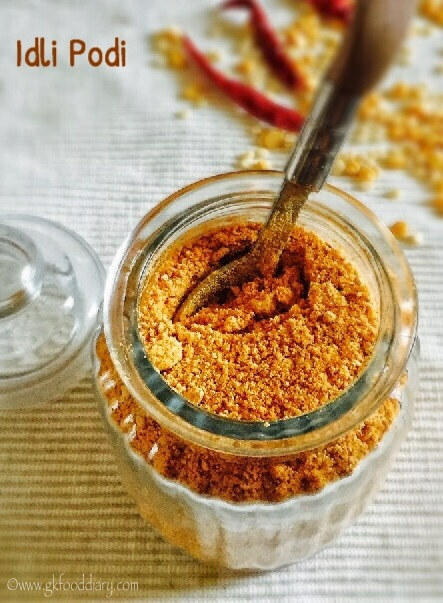 Here is how to make idli powder or idli podi recipe for toddlers and kids. Measure and keep all ingredients ready. Heat ½ tsp of oil in a pan, add red chillies. Roast them in low flame for 2 minutes until it turns crisp. Add hing and give a quick stir. Remove from pan once done and cool it down. Add another ½ tsp of oil and roast urad dal and bengal gram dal in a medium low flame until golden brown. Remove from the pan once done and set aside. 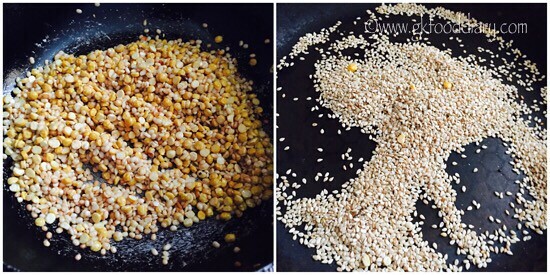 In the same pan, roast sesame seeds in a medium low flame until nice aroma comes. Remove from the pan and set aside. Firstly, blend roasted red chillies, salt and hing to a coarse powder. Then add roasted urad dal and bengal gram dal. Grind all together to a coarse powder. Then add roasted sesame seeds and grind it until it mix well with other powdered dals. 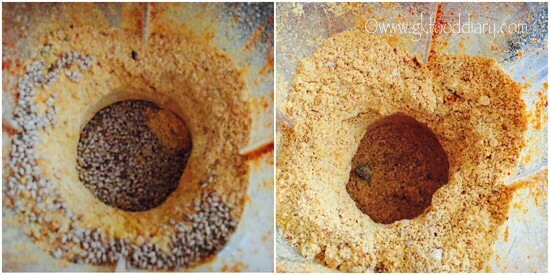 Don't grind sesame seeds for a long time as it may leave out oil. Transfer the corsely powdered idli powder to a plate and spread it. Cool it down and store in a air tight container. 1. Measure and keep all ingredients ready. Heat 1/2 tsp of oil in a pan, add red chillies. Roast them in low flame for 2 minutes until it turns crisp. Add hing and give a quick stir. Remove from pan once done and cool it down. 2. Add another 1/2 tsp of oil and roast urad dal and bengal gram dal in a medium low flame until golden brown. Remove from the pan once done and set aside. 3. In the same pan, roast sesame seeds in a medium low flame until nice aroma comes. Remove from the pan and set aside. 4. 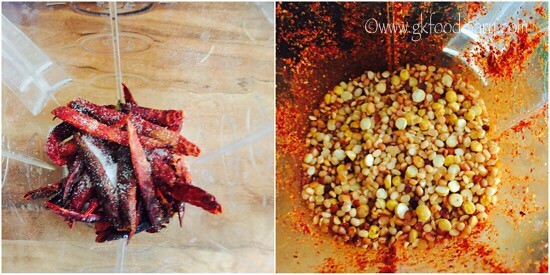 Firstly, blend roasted red chillies, salt and hing to a coarse powder. Then add roasted urad dal and bengal gram dal. Grind all together to a coarse powder. 5. 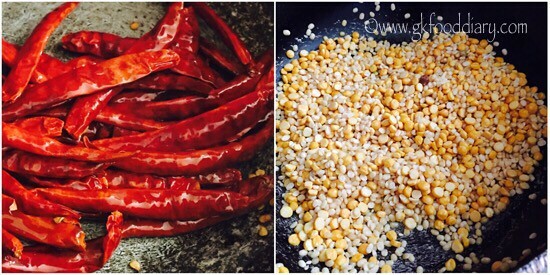 Then add roasted sesame seeds and grind it until it mix well with other powdered dals. Don’t grind sesame seeds for a long time as it may leave out oil. Transfer the corsely powdered idli powder to a plate and spread it. Cool it down and store in a air tight container. The idli powder is ready, mix it with sesame oil and serve with hot idlies/dosa. We always prefer coarsely grounded powder. You can finely ground it too. You can also add handful of curry leaves and few garlic cloves to make it more flavorful. Its medium spicy with the ingredients amount mentioned, adjust red chillies according to your preference and the type of red chilies used. 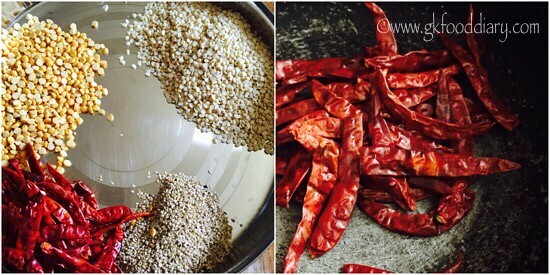 Make sure to roast the urad dal & Bengal gram dal well at the same keep an eye on the flame to not to burn it. 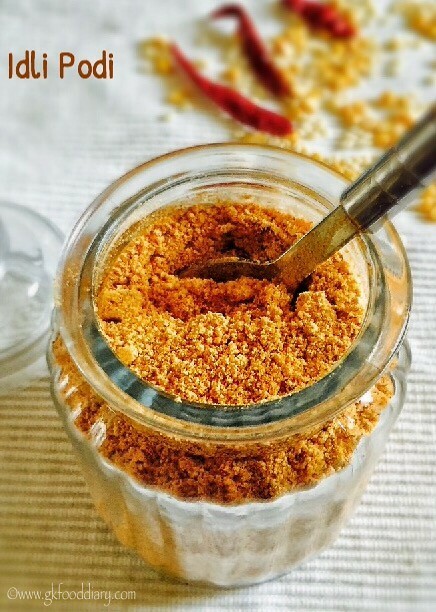 Store the idli powder in a air tight container and keep at room temperature. It stays well for 2 months if handled properly. Always check with your doctor before giving any new food to your kid. 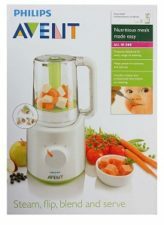 Make sure to introduce everything separate to your kid before you try this idli powder.